NiTech Solutions is a leading authority and expert on continuous processing. Its unique patented reactors and crystallisers are transforming the manufacture of chemicals, pharmaceuticals, food and drink, and biotechnology. NiTech’s simple, yet highly innovative, continuous flow technology meets today’s need for safer, greener, faster and cheaper manufacturing processes. NiTech also offers continuous filtration and drying technologies, where appropriate, through its engineering partner, Alconbury Weston Ltd (AWL) based in Stoke-on-Trent, UK. We can deliver commercial continuous flow reaction and crystallisation technology at laboratory, pilot plant and manufacturing scale. We can conduct feasibility studies for customers at our partner laboratories in UK, France, Sweden and USA in order to assist with the transfer of processes from batch to continuous. NiTech’s mobile continuous production platform (MCPP) – the DN Ultra – is a complete manufacturing system developed and manufactured in association with engineering partner Alconbury Weston. 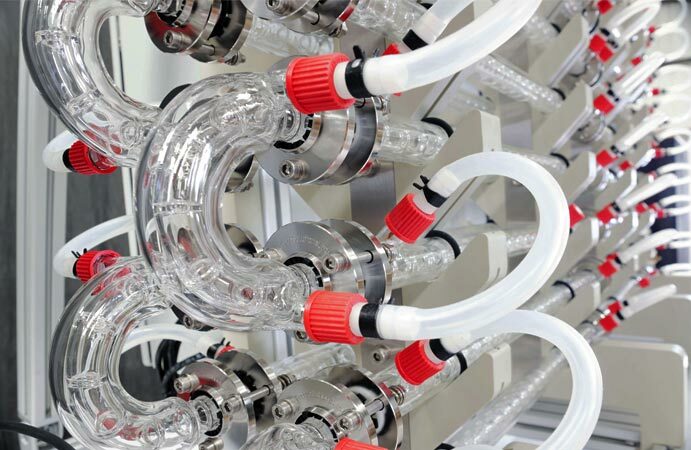 The platform includes a fully integrated reaction, crystallisation, filtration and drying system that can be easily scaled up to produce higher volumes by increasing the number of units used.